We take pride in the fact that since 1978 we have built solid relations with clients who know that they can rely on us for attentive service on a "one-to-one" basis. Our Customer Service Representatives are ready to consult with you about your job and assign one of our designers to handle your project from concept to completion. They are the liaisons between our clients and our Design Team. With the artist assigned to your project, our Customer Service Reps will set up a timeline so that you know when to expect your job in hand. Because all phases of a project are controlled in our Westwood facility, you will be informed about its progress whenever you call or stop by. 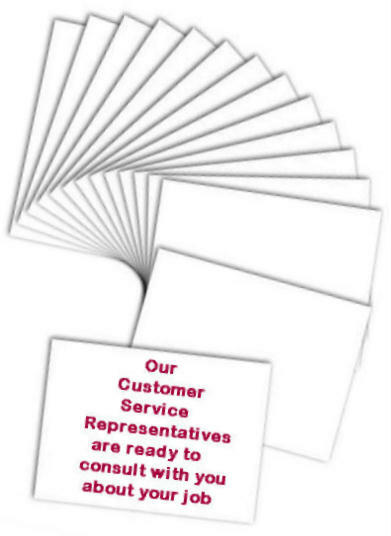 Our Customer Service Reps also will assist you with many duplication services and printing needs including invitations, personal or business stationery and business forms. If you need high speed color and blueprint copying, or need to send a fax or have a document laminated, Rays is the place to get it done.